The team at Blackbird have also pioneered other solutions for aircraft wheel and brakes. 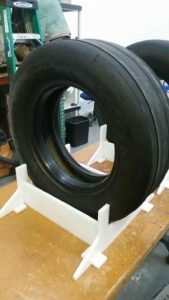 Wheel stands can secure a tire in place to easily install the wheel. High quality, affordable and easy to use custom stencils quickly help to identify tire changes and dates of install. Valve stem wheel protectors prevent breakage in transit. Blackbird’s brilliant turntables can handle up to 1k lbs and make it cinch to turn a wheel with one hand. 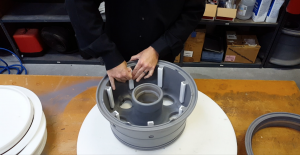 Wheel cone stands are used during the wheel primer process. Just spray and flip – there is no waiting for one side to dry. These workhorses ensure your business is as efficient as possible saving you time and money. Aviall, Honeywell, Aerolineas Argentinas, Copa Airlines and Messier-Bugatti-Dowty are big fans! All of our products can be custom made to each customers’ specifications, with different sizes, shapes and colors. Small and large orders are welcome. Please contact us at (954) 482-4269 or sales@blackbirdfyi.com for more information.